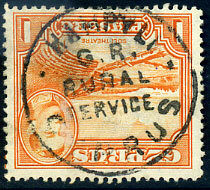 (T.21) on 1904 KE7 ½pi MCA wmk (SG.62). 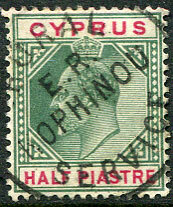 (T.26) on 1923 KGV 30pa green (SG.88). 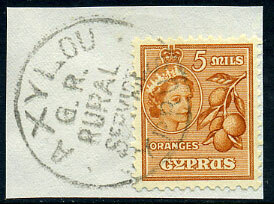 (T.31a) on pair KG6 ½ pi (SG.152a) piece. 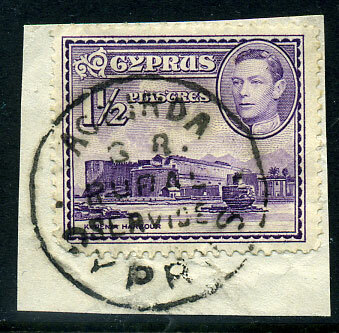 (T.31a) on KG6 ½pi (SG.152a) fragment. 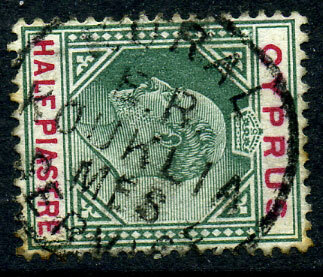 (T.23) on 1904 KE7 ½pi MCA wmk (SG.62). 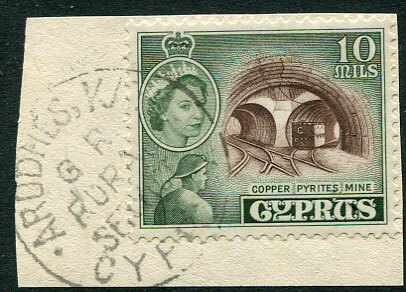 (T.28) on QE2 5m (SG.175) piece. 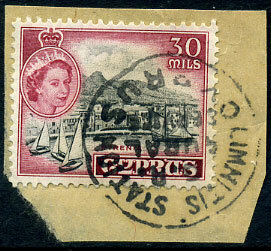 (T.26) on QE2 30m (SG.180) piece. 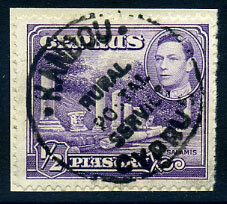 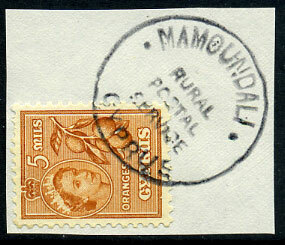 (T.28) in purple ink on KG6 1½pi (SG.155a) piece. 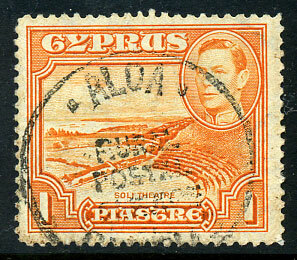 (T.28) on KGV 1pi (SG.77) piece, stamp with red ink spot on "T" of PIASTRE (uncertain as to whether this is a printing ink variety). 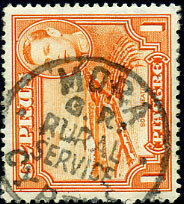 (T.23) on KE7 ½pi MCA wmk (SG.62), some perf. 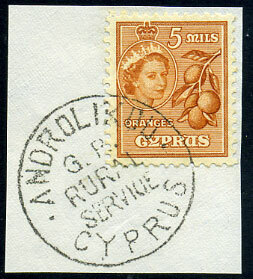 toning. 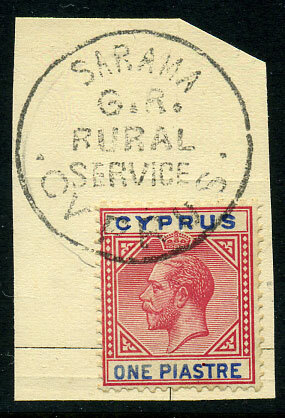 (T.31A) on undated QE2 5m (SG.175) piece. 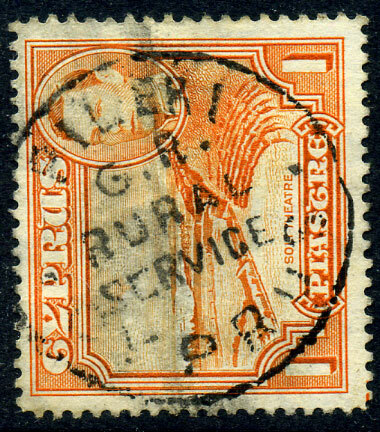 (T.31A) on KG6 1pi (SG.154). 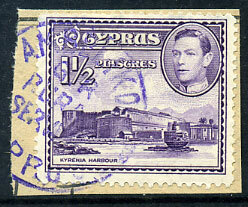 (T.26) on KG6 1½pi (SG.155a) piece.